As many of you guys know, Facebook owns WhatsApp, and for the longest time ever both apps and platforms remained relatively independent of each other, but that could soon change. 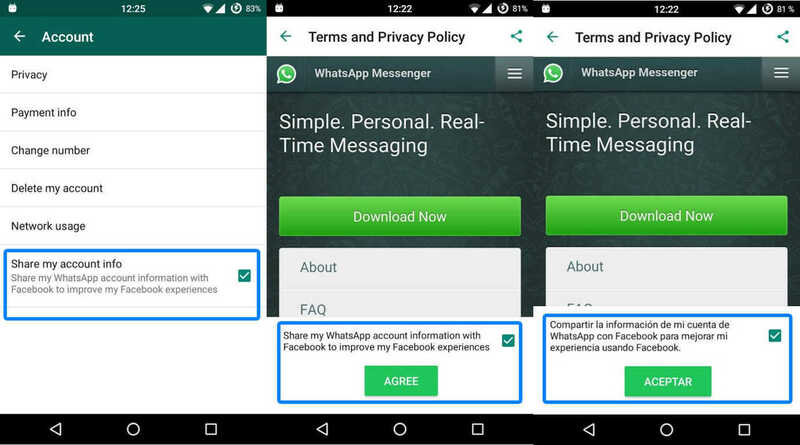 In recent update WhatsApp drops its yearly subscription fee and now they are going to share your data with Facebook. According to a recent discovery by developer Javier Santos (via Cult of Android), it seems that in a future version of WhatsApp, there is mention about sharing data with Facebook. If you enable the “Share my account info” option, WhatsApp will start share your data with Facebook. But it is unclear as to what kind of information is shared with Facebook, but it sounds like maybe it might have something to do with finding more friends on Facebook via your WhatsApp contacts, and possibly vice versa as well. If you’re a regular user of both Facebook and WhatsApp, then this might not be all that worrying for you. But if you don’t use Facebook regularly, you might not like the idea of sharing your private WhatsApp data with it. The good news is that in the discovery the feature was disabled by default, meaning that users still had the choice of turning it on if they wanted to. And also there’s a new “Documents” section where you’ll be able to find all of the files you receive from your WhatsApp contacts. Since its a beta release so it is unclear if any of these things will make it into a final version of the WhatsApp app.